Water can be incredibly healing for almost anyone, but especially those with limited mobility, handicaps, or elderly with pain in their joints. Being able to submerge in the cool water of a pool or feel the buoyancy after hours in a wheelchair or reclining in bed can also help take pressure off of joints in the back and can help prevent bed sores. So, if you can install a pool lift in your own yard, or you are looking to get an elderly or handicap pool lift in a caregiving situation or at a small business, this can be an excellent decision. When deciding which lift is best for your swimming area, there is much to consider. You need to factor in weight capacity, the type of pool, whether a manual or automatic rotation is necessary if you need features such as more lumbar support or armrests, and of course, your budget. It’s also an intelligent move to pick a lift that has passed the strict regulations of the Americans with Disabilities Act (ADA). Especially when around a potentially dangerous water situation for the elderly or disabled, you want a lift that will be safe and secure for those who have trouble getting up out of the water on their own. We selected our favorite models for your ADA pool lift or handicap pool lift options. Affordable and with 360° rotation, this mesh-seat lift is great for sliding under to lift out of wheelchairs. 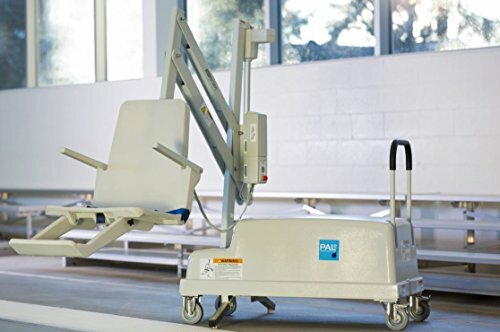 The Aqua Creek EZ Pool Lift provides manual lifting capabilities up to 400 pounds, making it excellent for wheelchair users and caregivers to assist with. It is portable for both storage and relocation to a different pool area. The robuststainless steel construction has an XCR coating which works even harder to prevent corrosion. We love the affordability of this lift compared to many other models. Moreover, the compact design makes it ideal for residentialpools. The concrete anchor offers an extra sense of security, which is crucial when being moved around potentially slippery areas. ADA compliant and easily movable on sturdy castors—this is a great portable option. If you want an extremely sturdy lift that can also be moved, the S.R. Smith 202-0000 PAL2 Fixed-Portable Swimming Pool Lift is ideal for portability in a pool lift. With high-quality, durable casters, this lift can be rolled to different spots around a pool, or to a different place altogether. We love that this lift also has a fully compliant battery charging system with the CEC appliance efficiency regulations for lifts sold in California and Oregon. The removable 24-volt battery is rechargeable, saving you from having to purchase a new one every time the battery runs low. With a handheld remote, this is an excellent lift for added independence or for ease on caregivers. The integrated armrests and included safety belt add to your feeling of stability in this sturdy lift. The S.R. Smith ML300 Swimming Pool Lift with Integrated Arm Rests is straightforward to install. Compared to some far heavier lifts, at 200 pounds this pool lift is on the lighter side, too. That does not mean it lacks in sturdiness, though. With an anchored bottom and coated stainless steel construction, this lift is durable and can withstand the elements. The S.R. Smith ML300 Lift comes with a 24-volt rechargeable battery as well as a waterproof handheld remote. Pool lifts sold to residents in California and Oregon are compliant with CEC appliance efficiency regulations—a bonus for residents in those states. We love the integrated armrests for added stability when getting in and out of the lift. We like the high weight capacity and multiple pools and spa use design of this lift. The Revolution Lift is ADA compliant and therefore adheres to the strict guidelines for safety. This lift is constructed of durable stainless steel that is coated in white epoxy powder sealant to make it even more resistant to rust and corrosion. We love that this sturdy device is made for both lightweight and heavier individuals. The strong build and high weight capacity make it ideal for above ground pools—when you sometimes want an extra feeling of security in a lift over an above ground height. 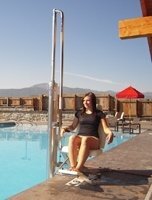 This lift is designed explicitly for both pool types, as well as spas. With leg rests, sturdy construction, a high weight capacity, and ADA compliance this is our favorite for a manual rotation model. The Aqua Creek Spa Lift Ultra is made to offer access to above-ground pools and jacuzzi is with wall heights varying from 20 inches to 38 inches, and with wall thickness up to 14 inches. This makes for an extremely versatile device to aid in entering or exiting your pool or assisting caregivers with the task. The Spa Life Ultra features a 24-volt rechargeable battery and a full 360° manual rotation. We love this complete rotating ability to allow you to enter your pool or spa from any side or angle you like. Even better: the lift is shipped already fully assembled. We found the installation to be straightforward. With a robust weight capacity of 400 pounds, this is also on the strong side which is a fantastic bonus. We love the fantastic price, low-profile, color options, and excellent ratings of this pool lift. The Aqua Creek Ranger Pool Lift is designed for both residential pools as well as small hotel pools. It is ADA compliant to the strictest measure, and sturdy with a four-point anchor bottom. We love that this high-quality pool lift is also notably less in cost than several comparable models. It’s a fantastic swimming pool lift with an excellent price. Moreover, the low profile and color choices give a sleeker, more aesthetic look to your pool, which we liked. An added bonus is its rechargeable battery that comes with a wall-mount charger and water resistant handset. The handset is a two-button corded remote that is designed to be independently operated by the user. This allows the individual full control of the lift. Or if needed, makes for ease in a caregiver-aided situation. With the outstanding ratings, we found no negative feedback on this lift—definitely a reassuring fact! With two anchoring options, a 360° rotation, and durable design, this is our favorite manual lift. The Joerns Hoyer Classic Pool Lift is an excellent value for a swimming pool lift. If you’re looking for an affordable, manual option in a pool lift, we love the price and simplicity of this design. With a robust weight capacity of 400 pounds, this is also one of the sturdier models we’ve seen for higher weights. It can be installed by either anchoring the bottom with smaller holes or drilling a larger hole into the concrete to cement the steel sleeve in place. This device is excellent for the elderly, those who use wheelchairs, or therapeutic uses in the swimming pool. Overall, we love it for the straightforward design and low cost. 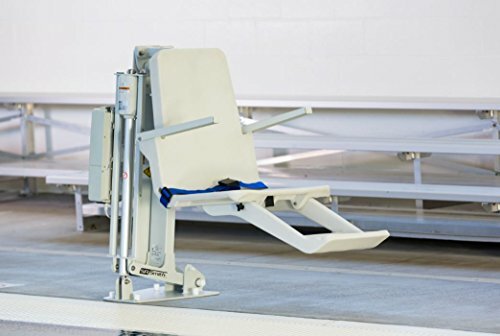 The outstanding stability, ADA and ABA compliance, and padded lumbar support make this a wonderful hydraulic pool lift. Wheels on base for portability. The Spectrum 27336 Gallatin Water Powered Assisted Access Lift is an entirely automatic, water-powered versa-lift that will work in conjunction with in-ground pools or spas with built-in benches. This hydraulic lift can be quickly and easily relocated to your poolside if you want to spend a day enjoying both a jacuzzi and pool thanks to the base stand’s wheels. The Spectrum Water-Powered Lift can be anchored between 18 inches and 30 inches from your pool wall. We love that the large diameter cylinder and piston make this lifting action of this hydraulic option quick and efficient. The device feels secure, holds up to 400 pounds (and actually feels stable at higher weights), and has an adjustable padded headrest and lumbar support. Keep in mind any wheelchair entry points to the general pool area and whether the placement of the lift anchor or cement installation will allow for enough room to turn a chair around if needed and will enable a caregiver to step in to assist in your desired location. When selecting a pool lift for those with limited mobility or strength, you will need to take into consideration a few critical factors. The type of pool, you or your caregiver’s specific needs, and budget are just a few crucial points to ponder before buying your lift. Pools are generally classified in three different ways: residential, commercial A, and commercial B. Commercial A pools are the more substantial competition or recreation pools such as those found at gyms or swim centers. Commercial B pools are often smaller and not the primary focus of the destination—for example, a small pool at a hotel or at a large fitness center with several other facilities such as cardio rooms and basketball courts. If you’re looking for a pool lift for yourself or someone you care for, more likely you’re in the residential market for pool lifts. With these pools, it’s vital to select a model that is appropriate for your type. There can be considerable differences in above-ground pools as opposed to in-ground pools. Moreover, even among in-ground pools, you need to consider the surrounding area and how your lift will be installed. Some in-ground pools are landscaped closely to the edge of the swimming area, or built in the infinity-style pool, while others have concrete surrounding the entire water feature. If you want a lift that can be installed by cementing the pole into the ground, such as with the Joerns Hoyer Classic Pool Lift you will need to check to be sure you have an area conducive to that. Most modern pools are made of either fiberglass, vinyl, or a concrete build. If you’ve been told your pool is gunite or shotcrete, this is a type of concrete pool. Gunite and shotcrete pools differ in how the concrete is mixed and applied when building the swimming area. The six features that almost every pool will have are the shell, a pool deck, bond beams, the coping, the bonding grid, and a gutter or skimmer. The pool shell is divided from your pool deck via an expansion joint. Your bond beam offers structure to the pool. This beam is usually thicker than the entirety of the swimming structure. The bond beam is traditionally topped with coping of some type, such as a coping stone. The width of your coping will govern which pool lift options are suitable for you. Most often, the coping is 12 inches to 14 inches wide, and most lifts will work within those parameters. You need to install the front anchors of your lift base (if anchoring instead of cementing with a steel sleeve) at least four to six inches back from your coping and expansion joint. 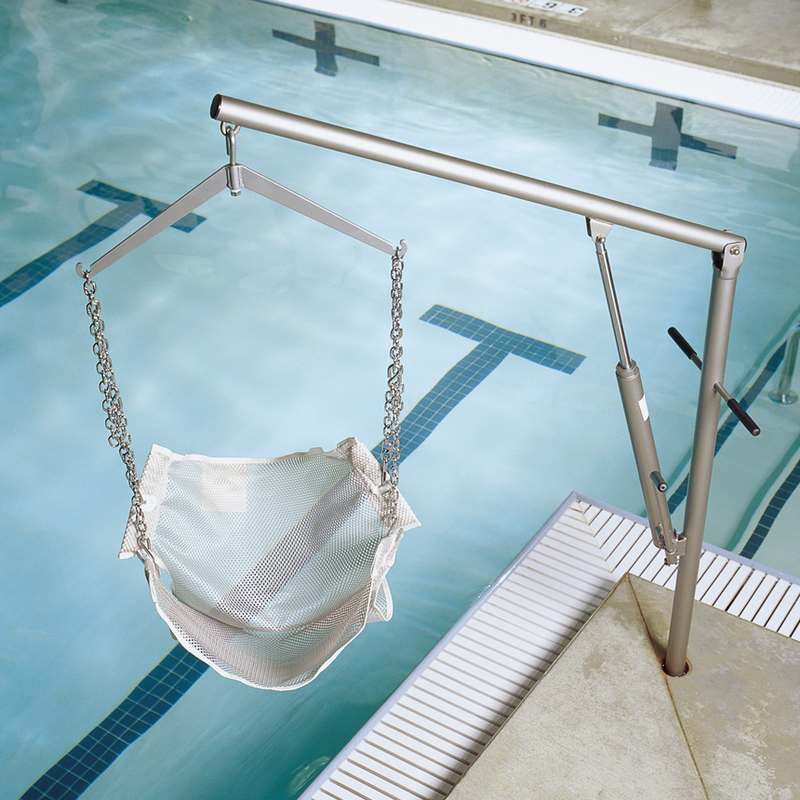 Pool lifts are also required to be installed where the water level is no deeper than 48 inches. This is not only for safety but also to allow someone to provide assistance while in a standing position in the water if it’s needed. Lifts also need to be designed so that your seat will submerge to at least a depth of 18 inches below the water level. This is meant to ensure buoyancy for your or the individual you’re caring for while on the lift, making for a more accessible entry or exit. Clearly, your specific situation will determine which pool lift is best for you. 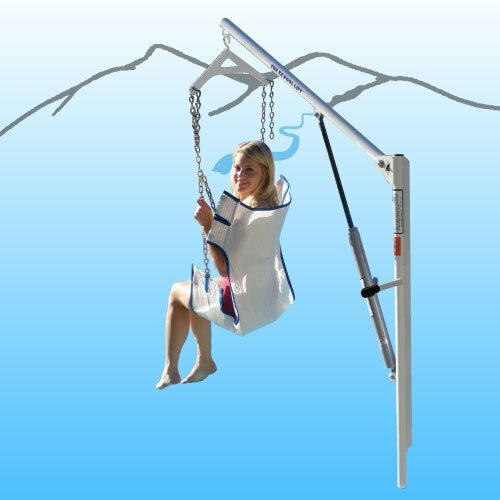 If you have an above-ground pool, which requires being hoisted higher on the lift over the edge of the pool, you’ll want something made for this type of use, such as the Revolution Lift. We also love the Aqua Creek Ranger Pool Lift, the Aqua Creek Spa Lift Ultra, and the Joerns Hoyer Classic Pool Lift for their excellent user ratings, ADA compliance, or classic design and low cost. Regardless of your selection, as long as you select a model based on your needs and situation, you can’t go wrong with any of these lifts.